Yesterday I wrote about our trip to the Michigan Renaissance Festival. Late in the afternoon the girls chose to spend the remainder of their souvenir money on face painting - surprise! Both girls have a thing for getting their faces painted (I guess most kids do)--- the bigger, and more colorful the better! At the risk of sounding like a grumpy old person: they call that facepainting? In my day they plopped a heart on your cheek and sent you on your way! Ever since the great facepainting fiasco of 2011, I've made sure to get a picture while the facepaint is fresh, to comfort them when it inevitably gets smudged/wiped/cleaned/showered away. For #tbt I dug out some pictures our favorite past facepaintings! Enjoy! On our very first trip to Disney World, Viola was given $10 in Disney dollars (you know, the ones with Mickey on them instead of a president?) to spend any way she wanted. About 1/2 way through the trip she decided to spent the entire amount to get her face painted while we waited for the parade. This in and of itself was fine, it was a good way to keep her occupied while we waited. Unfortunately, on that trip, Viola developed an absolute terror of the public restrooms with the "magic potties". When it was time for her to go, she cried and cried... and cried all the facepaint off, then cried some more over the ruined facepaint. All-in-all, it was the absolute worst day of our trip. It was ironic, therefor, that when we returned home and saw these pictures for the first time... they are some of my favorites from that trip! The facepainting was absolutely beautiful, even if it only lasted ten minutes! Disney World has skewed my daughter's expectations for quality. It's a fact. And it's the reason why I've held off on hiring performers for our birthday parties even though it's tempting. We pretty much treat Disney Face Characters the same way we do Santa Clause: so long as the girls believe they are real we try to craft their experiences in such a way as to maintain that illusion for as long as possible. I decided to look into the options for hiring performers in our area. Because she wouldn't have anything to compare them to, having not met the official theme park actresses, I figured it was safe-ish. So, I googled. Risky, I know. I found The Enchanted Princess Party and started emailing with the owner. 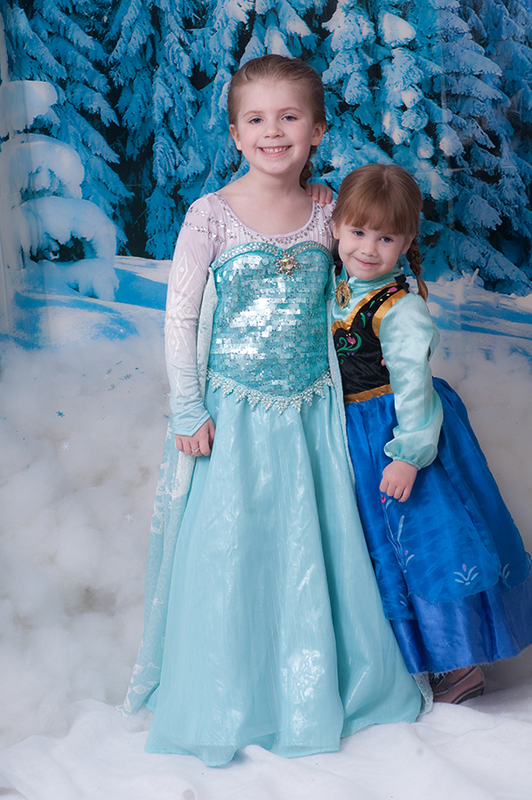 They had a Snow Queen costume and had been considering adding a Sister Princess option to their repertoire. I like to think I gave them the impetus for that. I could tell the owner had a high standard for quality and attention to detail and so I took a chance--- Not to spoil the ending or anything, but that leap of faith was rewarded many times over with an awesome, amazing, spectacular, memorable experience! But first, I wanted to share a few details of how we went about 'setting the stage' before the party, because I think that that was part of the magic for the girls. 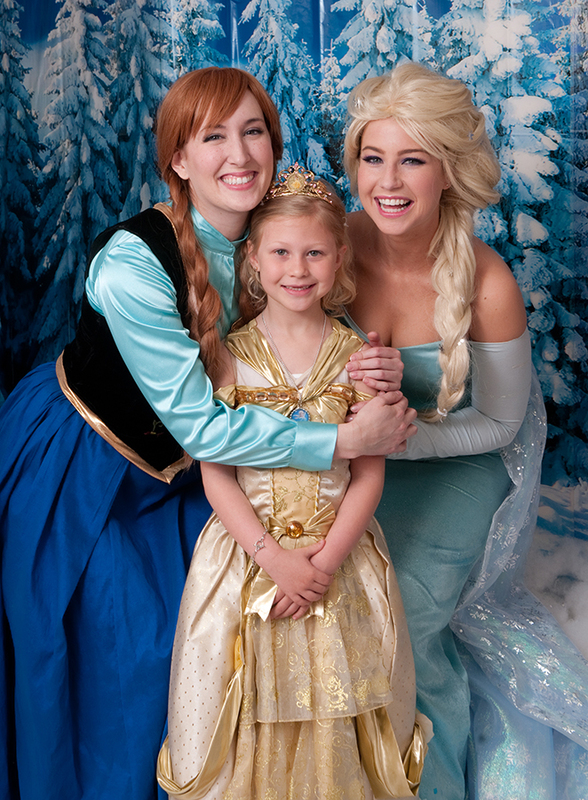 After we scheduled for Elsa and Anna to join our party, I worked with the princesses on how the party would run. I had a few ideas and they had some great suggestions and together we put together an itinerary I was really happy with (you can read more about that here)! Casually, I started talking to Viola about the sisters---- not unlike talking about Santa's Elves and the Naughty-and-Nice list at Christmas. I waited until the next time she mentioned not having been able to met them on our Halloween trip and opportunely suggested that she write a letter. She dictated her letter to me, then rewrote it in her own handwriting. She drew Anna's castle and Elsa's castle, addressed the envelope to Disney World and put it in the mailbox. Did you know that you can actually send letters to the Disney Princesses and your child will get a card back? It's pretty cool! But that wasn't our intention with this exercise. I snatched the envelope out of the mailbox when she was asleep and re-addressed it to our friends over at The Enchanted Princess Party. They brought the mailed letter with them to the house the day of the party, claiming to have received it and flown all the way to Michigan for the party! Proof! So how did the actual party go down? I had told Viola it was unlikely that the princesses could come even though she'd written a letter because they were all the way down at Disney World and very busy. 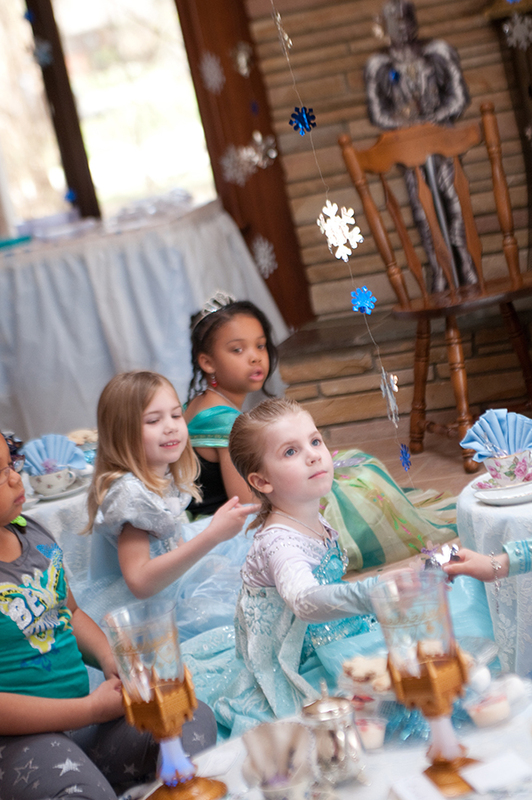 On the day of the party I gathered all the girls together in the 'ballroom' and began reading them the FROZEN storybook. We were just nearing the end when our storytime was interrupted by none other than the characters themselves! 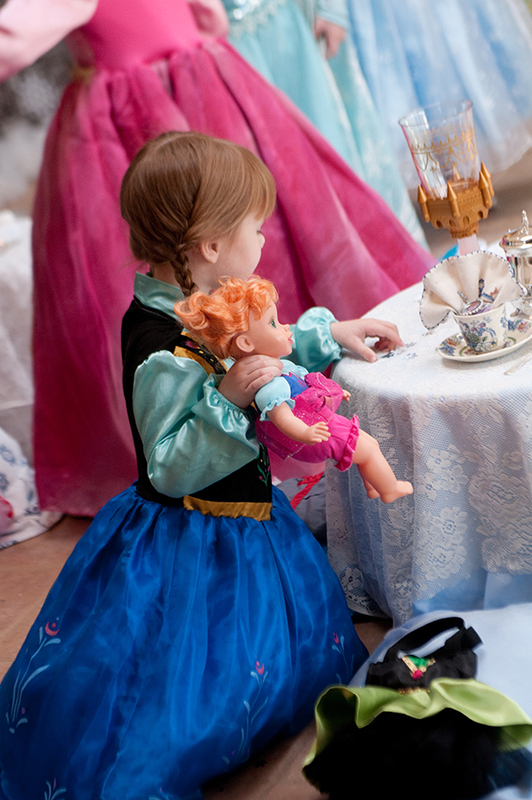 The sisters sat at the head table and led the girls through a proper tea party / proper princess lesson that included curtsying and table manners after which the kids all gathered around and sang the two songs from the movie: 'For the First Time in Forever' and 'Let it Go'. This was where I was utterly blown away. Turns out, the princesses could sing. I mean, really really sing! You don't expect any product or service that you find through a random Google search to be better than advertised, but that was the case here! Keep in mind that I have very high standards and am almost impossible to impress... most people I've shared the video with think they are lip syncing but I promise you that that is all them! They were AMAZING! 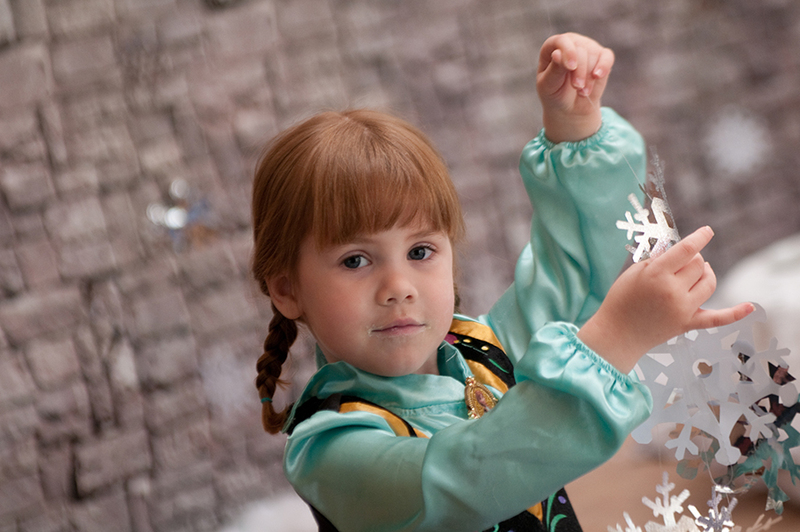 And then, to top it all off, as the finale to 'Let it Go' Elsa made it snow! In our house! Check it out!!! I don't know what we'll do next year that could possibly be as wonderful as this party was. 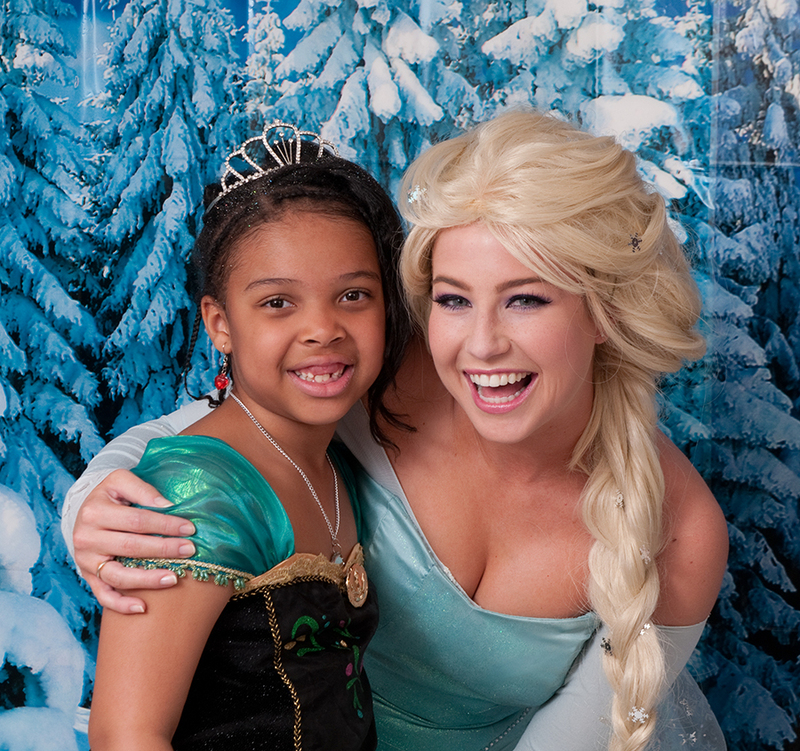 As I was tucking Viola in to bed that night she said, "Mom, I'm glad Anna and Elsa could come to my party. It didn't start out so good, but then it got better." I asked her what she meant that it didn't start out so good, and she had these sage words to share: "They interrupted your story! That was very rude. A princess should never, ever be rude. But we can forgive them because they were very nice and didn't mean to be rude to you." Princess manners, folks! Best of all, it bought me a brief reprieve on requests for another trip to Disney World for the moment! Lots of people have asked about the performers from our party and I'm happy to recommend them without reservation. They are available for Michigan and New York City. If you are lucky enough to be able to book them for your event I'm sure they will make it a memorable day for your child as well. 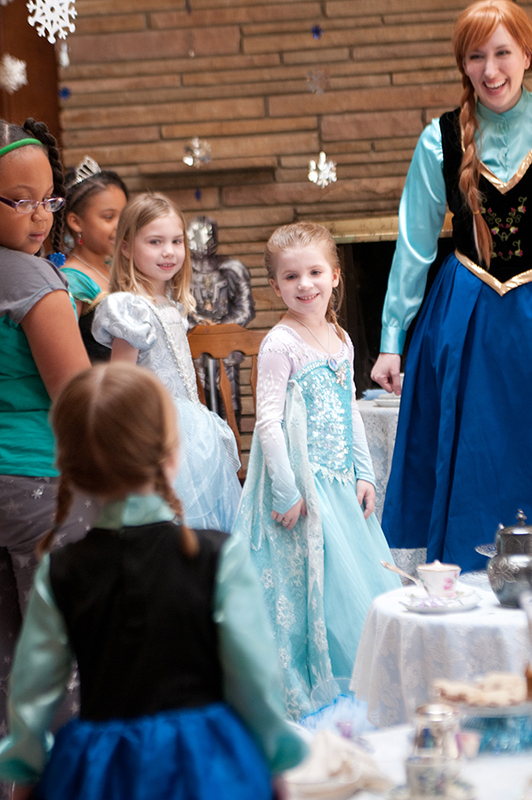 For her 5th birthday, Viola had an really fun Princess & Pirates party. 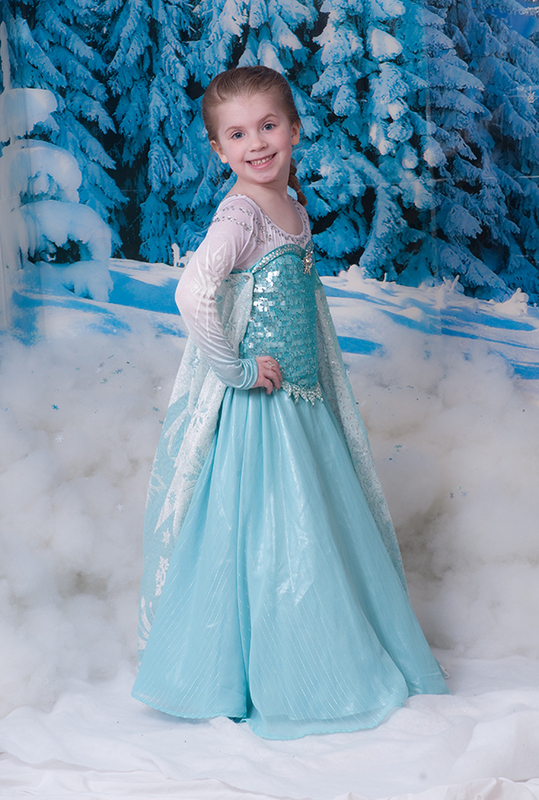 But for her 6th she had informed me she didn't want to do princesses again (because QUOTE "we did that LAST year.") and wanted to have a Luau theme instead. ....and then FROZEN hit theaters. I knew the movie would be big in our house as soon as I saw the previews: TWO princesses, an older one blond and a younger one brunette? It was as if Disney designed the movie specifically to strip the money out of my pockets. Suffice to say, the Luau party plans were tossed aside in Viola's mind the minute she stepped out of the theater and princesses were BACK ON! Fortunate for me, this was in November. I was able to take advantage of the post-holiday clearance sales and picked up a ton of snowflake and winter-themed decorations at rock bottom prices. 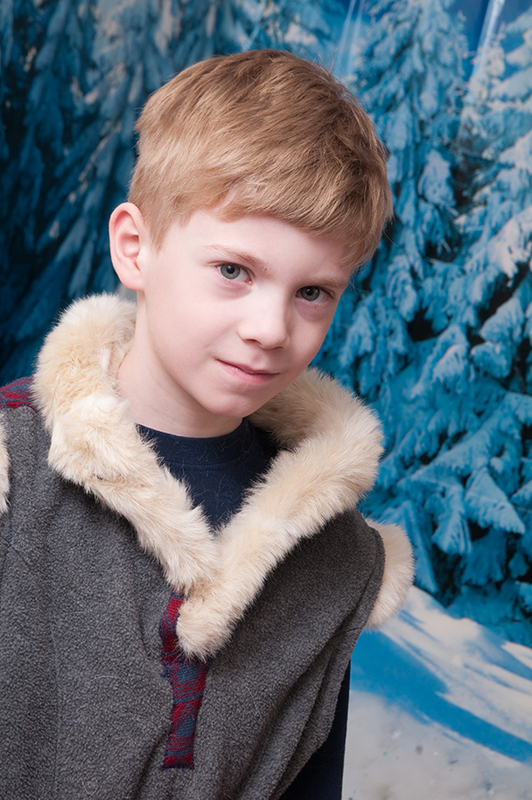 It was a little strange to decorate the house with snow in April, when we were all so desperately ready for spring, but the party was beautiful and the kids had a great time "bringing back summer!" (which was the theme of our games). So, now that you know how we got here, you probably want to know how the party went? Well, in short, it was AWESOME! I'll just let the images speak for themselves! All the princesses in a royal row! 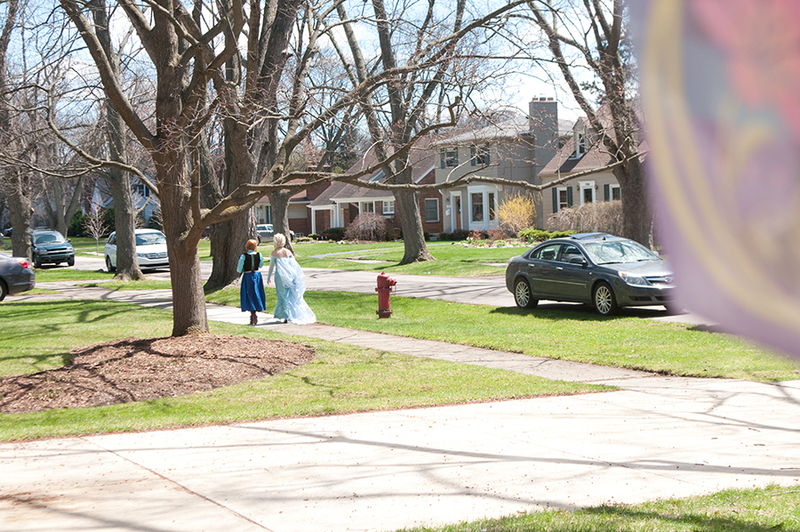 Viola of course wanted to wear her "realistic" Elsa dress. This is the Limited Edition Elsa dress from the Disney Store. 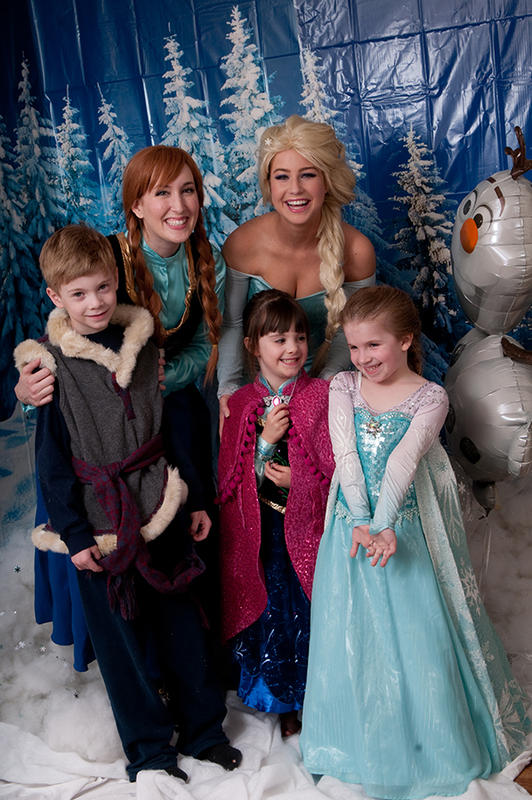 Frozen is all about the power of sisters and Eva was a big part of the party! Cinderella shoes with an Anna dress? Why not! Eva was excited for the chance to wear her Anna costume, as always. Chris was a good sport about coming to a princess party, so I knew I had to do something special for him! Be sure to check out my blog entry about how this costume was made! It was super easy! Viola's very good friends (and fellow Disney fans) joined us for her birthday and we were thrilled to have them! What's a birthday party without a little sugar. The candy buffet featured Lutefisk! - "for good feelings!" ... that's what I was gonna say! Delicious cookies from our favorite bakery! 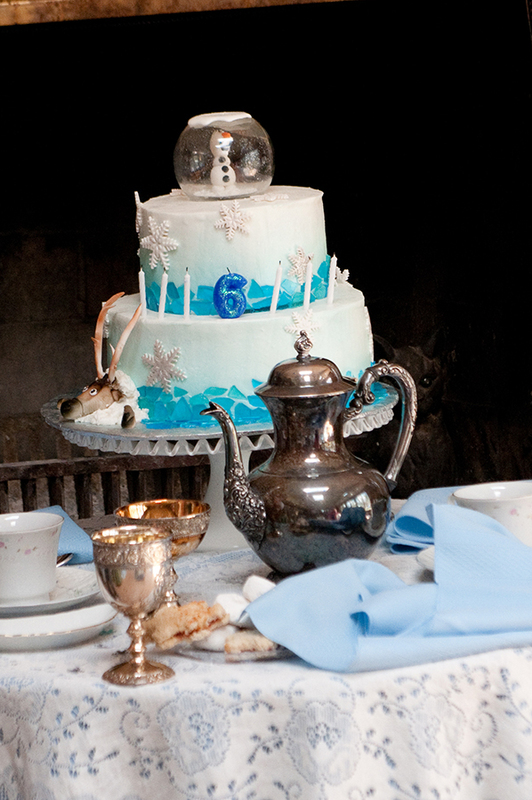 Anna & Elsa's head table featured THE CAKE! Reindeers taste better in frosting... snowmen, too! Candy "ice" around a snowflake frosting motif... what more could you ask for in a FROZEN cake?! Our great room was transformed into a winter wonderland for high tea. Snowflakes, snowflakes, snowflakes! The ballroom was behind a curtain for the first part of the party while the girls were arriving and getting dressed. They lined up and entered single file. Only Eva had snuck in, so it was a big reveal to everyone else, especially the birthday girl! Each girl had a place setting especially for her with a tutu-handbag that matched her favorite princess! Eva with her baby Anna doll, compliments of grams! ... but it made for some great photo ops! Inside each napkin was a "locket" with a cameo of each girl's favorite princess. The princesses claimed to have received Viola's letter (that she'd sent to Disneyworld), and even brought it with them as proof! 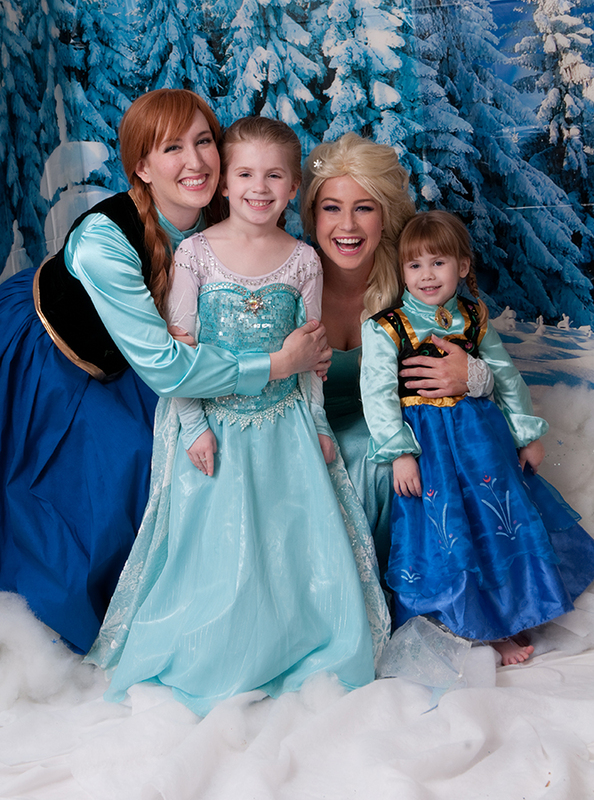 Anna & Elsa took over story time, and were much better story tellers than plain old mom! At the end of our sing-a-long, Queen Elsa surprised everyone (most of all me!) when she magically created SNOW and threw it into the air! (fortunately, we have tile floors!) Be sure to check out the video of the performances, they were really great! After they finished their cake the kids each had an opportunity to meet Anna & Elsa and have their photo taken at our makeshift Photo Booth. Kev wearing the handmade Kristoff costume and his sister wearing the Limited Edition Anna dress! A full cast of characters! 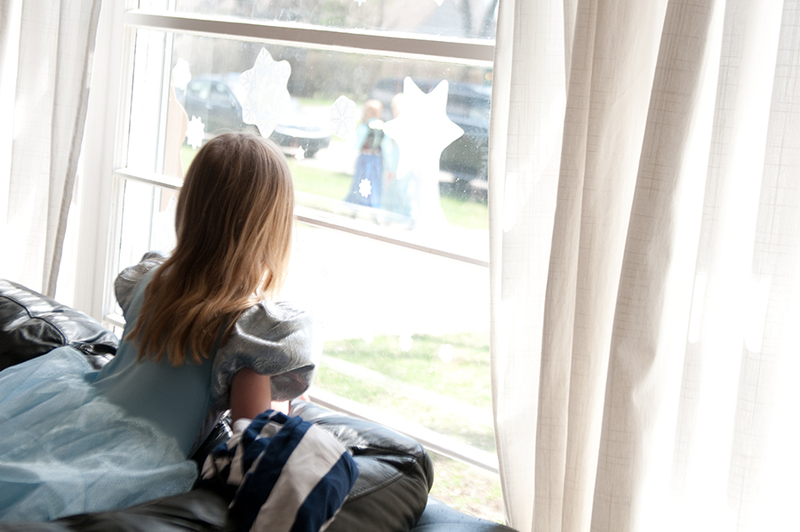 Viola's classmate wearing the vintage (discontinued) Cinderella dress. This is one of my favorites: I love the porcelain cameo at the waistline instead of the plastic pictures on the newer dresses. Viola's classmate wearing the super-rare (limited edition and recalled) Anna Coronation dress. Anna & Elsa snuck out while the kids were distracted by the games... well, most of them were distracted by the games! I love this picture. I just think it's adorable! It was SO HARD to keep them from jumping in the piles of "snow", as soon as the guests had gone it was the first thing they asked to do! A $5 bag of stuffing. The next best thing to empty cardboard boxes. What better than one Anna? Two Annas! When folks look at the pictures from the party they assumed it cost a fortune. It didn't. The truth is, the most expensive parts of the party were the cake and the performers. So, what's my secret? 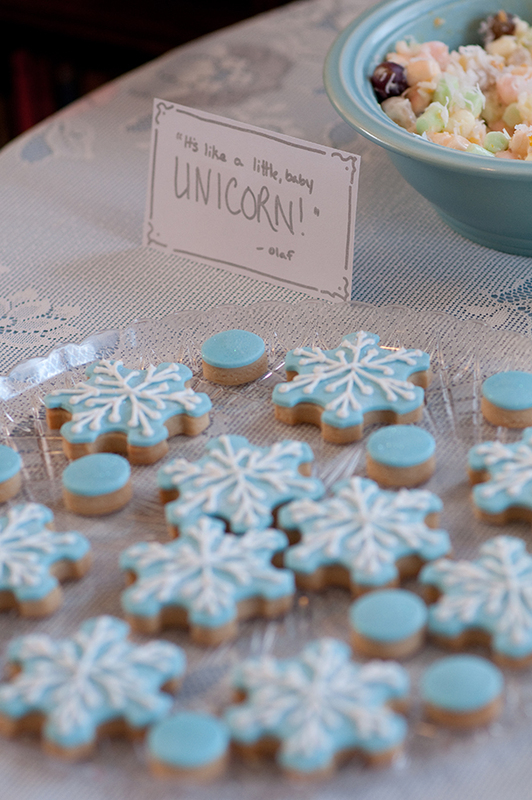 Case-in-point: I've gotten lots of questions about the little tea tables we used for our FROZEN birthday party. The 6 tables that we used for the party cost a whopping $0. They're actually cable spindles that I came upon at the office when the elevators were under repair. I asked the repairmen what they were planning to do with the spindles and they said they were headed for the dumpster. So I asked them to put them in my car instead. No actual dumpster diving was required, which I consider an added bonus! One man's trash is another man's tea table? I had a vision for some pretty blue patterned pillows that I imagined would be re-usable, but Viola insisted that the seats be snowflakes. We were very fortunate to find on clearance some XXXL snowflake pajamas at the mall that we were able to get 4 pillows out of as well as a white-snowflake top sheet from the thriftstore that was enough to make the rest! Phew! Of course, it was fortuitous that a few weeks prior to the party I came across the spindles. But that's where the other half of the advice comes in: PLAN AHEAD. When you know what the theme for the party will be well in advance, you can keep your eye open for the things you will need. And I don't just mean impromptu tables. We found most of the teacups for under $2 at thrift stores and garage sales. I couldn't have walked in and bought 12 teacups for that price, but over time I was able to find them here and there. The same with the tea pots. And the decorations that had to be knew (the balloons, snowflakes, etc.) I was able to get on clearance after Christmas because I knew we'd be doing FROZEN in April. We were also able to re-use many of our decorations from last year's Princesses and Pirates party, too, namely the castle wall room wrap, and the tablecloths. (Keep in mind that the tablecloths themselves were thrift store finds last year, so I'm not sure if that counts as re-using or up cycling... or both.... re-up-use-cycling, perhaps?) Because I have two girls, it's safe to say that I have a few more princess parties ahead of me so I try to save anything I think I'll be able to re-use. 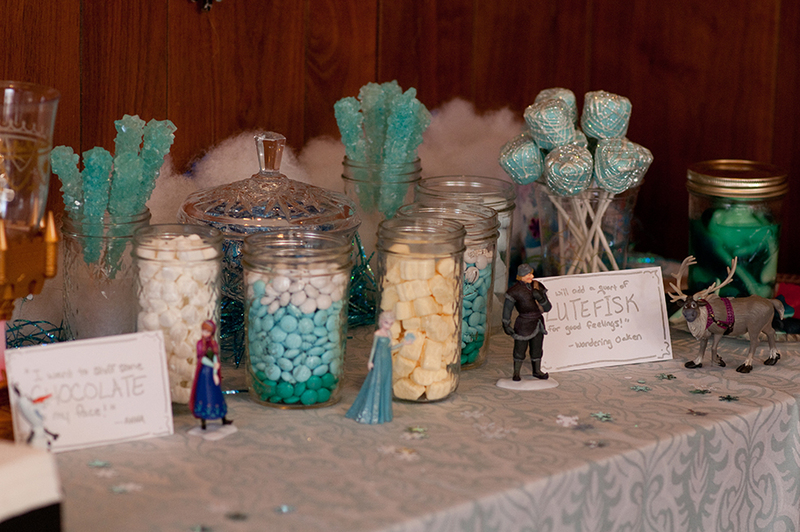 One last fun little upcycling detail from our FROZEN party: each tea table had it's own centerpiece filled with treats. These were actually made from very inexpensive plates that I bought from IKEA and glued together using zots and easter basket grass for color. During the party they made beautiful centerpieces, and after the party I ended up with a cute set of summer dishes! Each one cost about $8 in materials. 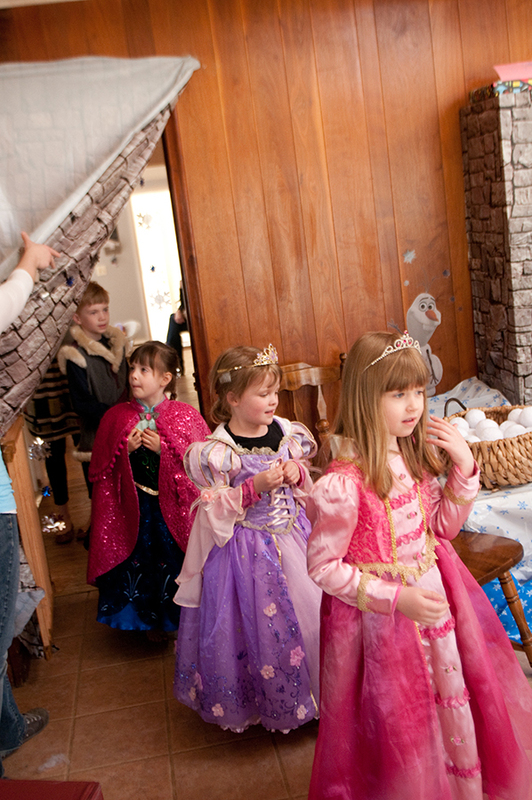 So, remember: the key to an elaborate yet affordable princess party: plan ahead and upcyle! Save the things you think you'll be able to re-use next time around! Look for discounts and clearance items! Get inventive! And stalking your local thrift store doesn't hurt, either.... You never know what you'll find! Be sure to Pin and Share it in on Pinterest!